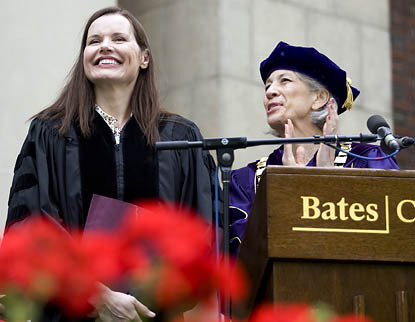 The actress was one of five figures prominent in their fields to receive honorary degrees in a morning ceremony on May 31. Joining Davis in addressing the 472 graduates and their families were the Rev. Robert M. Franklin Jr., president of Morehouse College; biomechanics researcher Mimi A.R. Koehl; Maine philanthropist and 1951 Bates graduate Ralph T. Perry; and columnist and CNN host Fareed Zakaria. There was a celebrity of sorts among the graduates, too. Fifty-five years after leaving Bates to join the army, Carl Harris of Salem, Mass., was among the graduates receiving a Bates diploma. 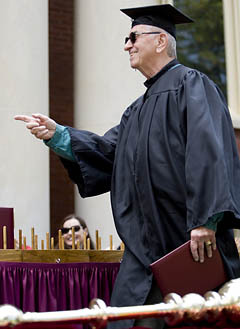 Harris, 75, returned to Bates to complete his degree and is the second-oldest person (after an 83-year-old graduate in 1931) to earn a bachelor’s degree from Bates. Reflecting the nation’s new political reality, the theme of change amidst trying times dominated the advice offered graduates during the two-hour ceremony on Bates’ Historic Quad. 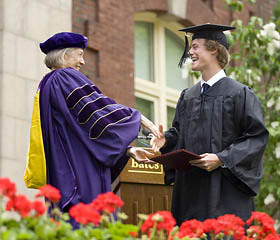 In her opening, Bates President Elaine Tuttle Hansen recalled the historical context distinctive to the Class of 2009. While its members were arriving at Bates amidst “sunshine and beginnings,” the Gulf Coast was reeling under the catastrophe of Hurricane Katrina. Four years later, the class began its senior year just as the subprime mortgage crisis touched off our current economic woes. “Bates people neither ignore nor dwell on the worst. They ask what they can do to make things better. You will confront difficulties by rising to the occasion and being the very best that you can be,” Hansen said. Geena Davis, joking at the top of her speech that “hereafter, I’d like to be referred to as Dr. Davis,” deftly wove humor and a call to action together in her talk. She described the work she is doing, through the Geena Davis Institute on Gender in Media, to research the disparities between Hollywood’s depictions of women and of men, especially in programming for children. Looking more broadly at gender inequality in America, Davis noted that only 16 percent of the members of Congress are women, and if women supplant men at the current rate, it will take 500 years to even things up. A Maine businessman whose success engendered a remarkable record of philanthropy, of which Bates has been a major beneficiary, Ralph Perry asked the graduates to consider the very notion of success. others with dignity and respect, having high expectations of oneself and others. Franklin prefaced his talk by reaffirming the long, strong relationship between Bates and Morehouse. He said, “Morehouse thanks Bates for our greatest president, and Bates alumnus, Benjamin Elijah Mays,” a member of the Bates Class of 1920 who drew to Morehouse students of the caliber of Martin Luther King Jr.
“Become renaissance women and renaissance men, with social conscience and global perspective,” he urged. In a reference to Mahatma Gandhi, he told the graduates to beware of the deadly sins of modern life, such as commerce without morality and pleasure without conscience. Finally, citing civil rights leader King, he told the graduates to be “transformed non-conformists” — the people who turn their differences with society into a different, and better, society. listeners not to fear crossing boundaries, in learning and in life. “Problems facing the world today are so complicated that it’s going to take people who can talk across boundaries and work across boundaries to solve them,” she said. Drawing what appeared to be a substantially larger crowd than past years, the ceremony filled the leafy Historic Quad. As the occasional clouds gave way to brilliant sun, bursts of maple seeds glittered down onto the gathering like confetti. Maine and 26 members of the class come from other countries. Political science was the most popular major for members of the class of 2009, with 63 graduates. Second place went to psychology, with 57, followed by economics with 56. Thirty-five women and 21 men took double majors, with French and Spanish (tied for first place), economics and history being the most popular second majors. 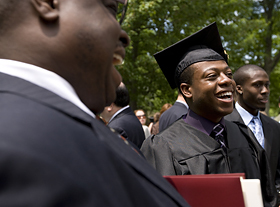 Seventy-three members of the class of 2009 earned bachelor of science degrees, with the remaining 399 earning bachelor of arts degrees.